We’re asked about our design all the time – usually in an incredibly kind way full of high fives and “how’d you do that? !”s but sometimes in a “ugh, did you even think about talking to a customer? ?” kind of way. So, we decided to give you a week-long deep dive into our design process in this “Designing Data” series. Stay tuned every day this week for a next step in our design process – and let us know what you think about every one of them. Design is pretty important to us. We have one job: Taking a crazy amount of data and turning it into something meaningful, so people on the front-line – people who don’t always have time for numbers – know exactly what to do and when to do it. Without good design that’s just not possible. If it takes them 10 minutes to figure out what the numbers stacked in front of them mean, let alone what they should do with them, that data might as well not exist. But it’s not just about pretty. Design is way more than the visual. Design is a process of understanding. Where do people want to be and how can we make it stupid easy for them to get there? When we say design we mean everything: from the look of things when your traffic spikes to why you want to know that in the first place. Design is a holistic process that’s about people and solving their problems – and making it beautiful while we’re at it. So we start, unsurprisingly, by talking to these people, watching these people. We don’t lock ourselves in a room and run through scenario after scenario with fictional, ideal users and refrain from putting anything out there until it’s completely finished. We actually get out there and find out what kind of problems people are facing and solve those first. We put out stuff that isn’t done, and sometimes we’re not even totally confident in it. Because we – and our early testers – don’t have all the answers. But we’re getting ahead of ourselves. Tomorrow, we’ll get into the nitty-gritty of the user research portion of the design process and explain all of this launch-into-the-wild stuff later this week. The world outside your website is tough to manage. You have die-hard fans extolling you in 140 characters. You have newbies who aren’t quite your target stumbling upon you via, er, StumbleUpon. And your regular guys constantly checking up on you through their iPhone apps. For a long time people have looked at the social audience, in particular, as its own discrete segment living in a vacuum to be treated totally differently from the rest of your audience. But really, they affect your site traffic and engage with your content like everyone else, don’t they? Shouldn’t you know just how much they’re affecting your site? We sure think so. So within the new Social View on your Chartbeat dashboard, you’ll see the whole world of your social visitors. There’s a ton of easy-to-digest information about what’s going on with your site as seen through the social web. In a single view, you can see what people are saying about you, how many of your current visitors came from social channels, and what pages are powerhouses on social networks. 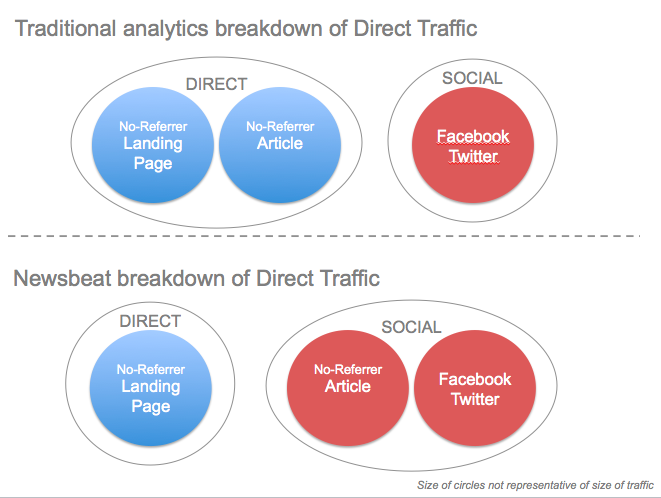 Social traffic can make the difference between an ordinary day and an extraordinary day. It’s important that you can now dig through that list of your most social pages and figure out what makes them different, so you can get the same kind of oomph out of the rest of your pages. …and behind all that iOS code. Your iPhone and iPad app is kind of like an entirely different site. It reaches a potentially totally new audience for you. It’s important to track the differences between your site and your apps. So, we’re beta testing an iOS app tracking feature, too. If you have an iPhone or iPad app, install away through your dashboard sites page and let us know what you think. (Remember: the key word is “beta,” so we’re looking for your feedback and understanding that it’s not done yet). And don’t forget to sign up for the Chartcorps virtual workshop to get a more in-depth look at social, iOS tracking and everything in between. We hate to break it to you, but you’re not in a monogamous relationship. Your audience has been seeing other sites. While your site is amazing at some stuff, it probably needs some TLC in other areas. But which ones? Is your audience ending up with your competitors because their search results are amazing while loving you because you’re killer at social? It’s time you knew how you stack up against sites like you. As part of the Chartbeat network, you’re one of thousands of sites we monitor every day. We’ve anonymized (so no one knows your site is compared to theirs and you won’t know exactly who is in your Peer Group either) and aggregated our network of data, filtered it through some intense algorithms and will now be delivering it in context for you in a new feature called Peer Stats. 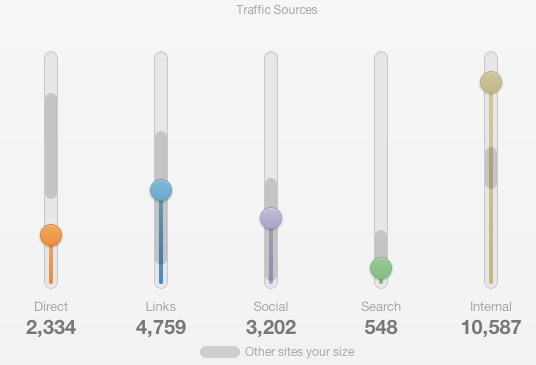 Peer Stats let you see information about sites that are similar to yours. What does similar mean, you ask? Great question. Right now it’s based on a bunch of stuff like your daily traffic pattern, size of your site, and your industry. This last part we need your help with. The first time you log into your dashboard, we’ll give you a quick survey asking you what kind of site you have, so we can make sure you’re matched up with the right competitors. Big sites are different from small sites, and your tech blog is different from that guy’s Tumblr with pictures of dogs standing on things. You treat yourselves differently, and so do we. In fact, because we know your site is different from all the others, we’ve also given you new ways to learn about your own content. Until now you’ve seen top pages content – only those pages with the most traffic. Now, we’re introducing Notable Pages, which highlight the most interesting aspects of your site, regardless of the amount of traffic they’re receiving. Say you have a page that’s suddenly getting 99% of all traffic from Social sources. Whoa. Huge. Important to know why that’s the case when the rest of your site is averaging around 20% of its traffic from Social, right? Maybe you can learn from this page and apply those insights across your site immediately. 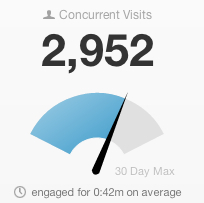 Or there’s a page that’s suddenly surging with new user visits vs. the returning users that it normally gets. You should probably create some new content or related links or the like to make sure you treat these new users carefully to convert them into loyal members. Notable Pages and Peer Stats give you a bit more context to the story of your site. They give you an instant answer to how your site’s doing today. Remember, our Chartcorps team is hosting a weekly virtual workshop for you to get the full rundown of all the new dashboard can do. Sign up! Three years ago this month, Chartbeat launched at the web 2.0 summit. Today Chartbeat is beating under the hood of sites across 37 countries and takes the pulse of around 5 million visitors across the web at any one moment. Fantastic clients like ESPN, Fox News, The New York Times, Forbes, Fab.com, and Gilt Groupe have partnered with us and helped us to understand the contours of this new world of data. Today, I’m excited to announce the next chapter in Chartbeat’s history: a new round of funding, new look, new dashboard, and a whole bunch of new features. That’s a lot to get through, but I promise to be brief. We’ve just closed a $9.5m Series B round of funding led by Josh Stein at Draper Fisher Jurvetson and Saul Klein at Index Ventures, and they’re joined by some of our favorite Angel investors. Saul has been a constant friend and guide over the last three years and helped us take the time to find the right partner that will continuously help us push Chartbeat and the real-time revolution forward. We found that partner in Josh Stein. Josh took the time to get to know us over the course of a year, has incredible experience of building great SaaS companies like Box and SugarCRM. Most importantly, Josh just plain got it. Thanks Saul, thanks Josh, we’re going to make you proud. 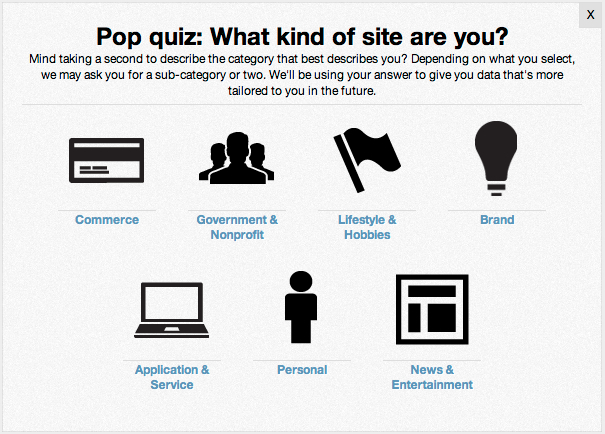 The first thing you’ll notice when you hit Chartbeat.com today is a very different look. We’re growing up. And growing up means making sure we’re as good looking on the outside as our dashboards are on the inside. We’re also making things simpler. Newsbeat has become Chartbeat Publishing: the command center for all serious publishers of media and content. Common understandings of engagement have always relied upon explicit actions (a like or a share) taken by a few people or traditionally inaccurate guesstimetrics like “time-on-site.” At Chartbeat, we wanted to accurately understand how engaged each person who visits your site is, not just the people who hit the like button. So we built Engaged Time. Window open in another tab? Doesn’t count. The visitor isn’t actively viewing, reading, commenting on the page? Doesn’t count. 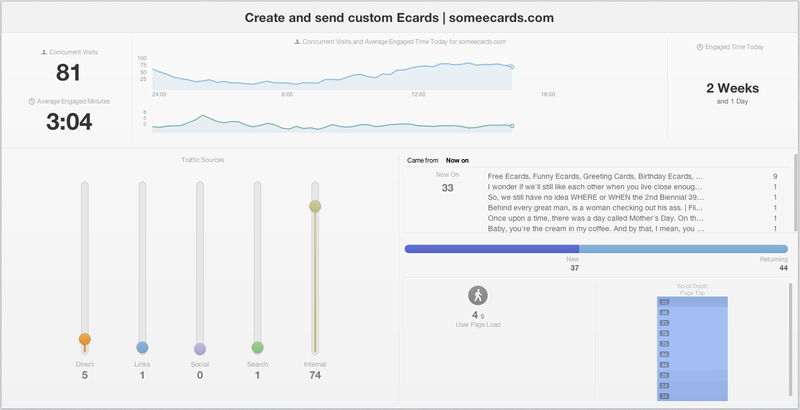 With Chartbeat’s unique way of measuring, Engaged Time counts the amount of time someone spends actively interacting with your site and enables you to see your site from a completely different perspective. For the very first time, you can finally go beyond eyeballs and clicks and understand which content is making an impact, what’s engaging people’s heads and hearts. When you’re looking at your data – whether Chartbeat or otherwise – I bet the first question you ask yourself is “Is this good?”. You generally know if you’re doing well compared to yourself, but what about your competitors — those that are fighting for the same eyes and hearts that you are? We’re introducing Peer Stats, which does just that. Now, you can see your data, put in context with the anonymized, aggregated stats of your sites like yours all in real time. Are we getting as much social traffic as we should? Is our page load speed fast enough? For the first time you’ll have a frame to understand your performance in the context of the wider web, so you know where to focus and when to celebrate. When something important happens, you want to know about it — whether it’s on your site, your iPhone or iPad app or across the social web. So why should you only see real-time stats of who’s on your site? You shouldn’t. Chartbeat is going beyond the site. From now on you’ll be able to get real-time data from your iPhone or iPad app as well as your site. 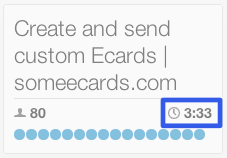 This feature is currently in beta so we’re going to need your feedback, but we’re super excited about it. 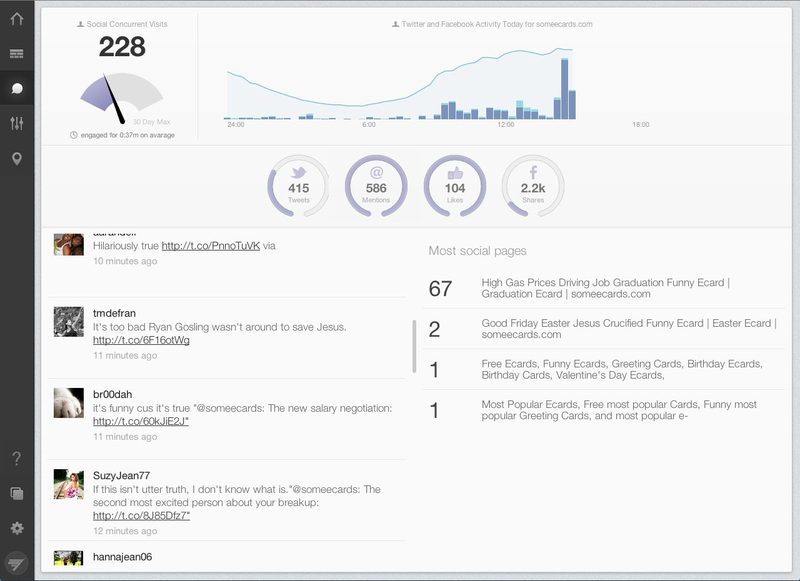 We’ve also launched a new Social View that brings the social data you need into one dashboard. You’ll get loads of insight into not just who’s talking about you where, but how that’s affecting your site traffic. We hope you like all the new things we’ve been working on. The only thing we ask of you in return is your feedback. Let us know what you think about your new dashboard as you’re rolled into it over the next few days. We can’t thank you enough for the love and support thus far. We’re excited to get to work and take this thing to an even higher level.